Trampolene have been around for a couple of years now. After a couple of thrilling early singles, they released their first Pocket Album last year and are following it up with a second one, effectively a five-track EP. It retains all the chaotic thrills of their previous releases from their loud guitar assaults on the senses to a more sensitive battered and bruised reflection on life and love. Opening track Imagine Something Yesterday opens with a thrashy guitar riff that meets the listener head-on. Jack hardly pauses for breath as he belts out the tale of youth "twenty three, always up for a dare, living the dream and smoking a nightmare." It's loud singalong material for festivals with backing vocals you can imagine the fields singing back at Jack. Although they're a different band, it reminds how the Stereophonics broke through without (initially) compromising themselves with great tunes that people can relate to. We think (and hope) that Trampolene have a bit more about them. The guitars are even louder on I'm On My Own, a massive stomp of an intro and then repeatedly coming back in and grabbing the listener by the ears. There's a familiarity to it without it sounding cliched or copyist, trading in huge squally blasts of guitar that are so full on they should be completely overblown, but they're not, the same with the lyrics by means of example "I'm on my own, don't even need my soul tonight." The next two tracks show a very different side to Trampolene, displaying Jack's ability to write lyrics that reflect on real life and love, the simple romanticism of Cinderella's Shoe, piano repeating itself throughout, some soft understated vocal harmonies and its reflective tone "this song is so small, it would fit in Cinderella's shoe it describes the massive feeling I have for you. Maybe I'm wrong and there's no beauty in this song, but it's something I do with you." It's imbued with a mix of positive reflection riddled with seeds of doubt. It's simple but beautiful. but much darker "in love with my armchair and my Newcastle Brown, if you try to move me, I won't budge". It's a tale of an individual in their own world lost in a downward spiral, acting as if no one else matters, but crying out, holding a hand out to a loved one "If I die tomorrow, could you love me for who I am." Whether it's intended as auto-biographical or not, it touches the listener because of its honest lies in its simplicity, the way human emotions are expressed so succinctly. 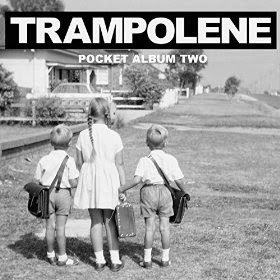 It's an intriguing end to the pocket album which demonstrates that Trampolene are equally in control and communicative with the amps cranked up or the piano toned down and confirms that they are no ordinary band and that Jack Jones is no ordinary front man. Pocket Album Two is out now digitally via iTunes. Trampolene's official website can be found here. They are also on Soundcloud, Facebook and Twitter.